We hopped in the dinghy and motored over to the anchorage as fast as we could to find out where our little boat was. It had floated towards a marina and was stopped by two dock guys. It was headed right for a million dollar yacht. The anchor line had been cut. Clearly cut and little boat was set adrift. Once we located her and got her safely back into a slip, I had much time to reflect on what had just happened. Why would someone do such an aggressive act? Someone could have been killed or badly hurt. A boat adrift could damage property and cause thousands of dollars in damage. What was God trying to say to me? I pondered on this aggressive act for days and I reflected back in time. Before I was gifted the little boat, my intentions in a few months was to walk, write and roam the East Coast until my book was finished. I had found a wonderful editor who was excited to walk the writing distance with me and 2018 was going to be a productive year on the road, not at sea. Once I was gifted the little boat, the intention shifted and a new intention was suggested for me to sail the East Coast instead of roaming it and to finish my book on the boat as I sailed. That all sounded cool and groovy, but honestly, it didn't feel right. I tried to envision myself floating on the sea, writing my book and experiencing the now alone and it actually brought me angst; floating, writing and experiencing would be a small part of my day to day. I knew that sailing the little boat would be a lot of work, I would rarely write and my time would be spent alone, not with people. That definitely wasn't feeling right. Plus, there's always some kind of mechanical failure on a long sail in any size boat and being stranded somewhere was a very uncomfortable feeling. Bad weather is inevitable and on a little boat, it is felt more strongly. Did I really want to deal with things like this? Blisters on my feet are much easier to contend with than engine problems. Thunder and rain is much easier to deal with on land than in the water. Alone. An anchor line broke at sea could send me adrift hundreds of miles away especially if it happened in the night. A major rain storm could kill me. I kept my uncertain thoughts to myself because I knew clarity would eventually come. Maybe I was just letting fear get the best of me or maybe this uncertainty had validity. For now, it didn't matter. I had a few months to think about it so I just focused on restoring her. I cleaned her up, bonded with her and envisioned myself sailing her a thousand miles. Cleaning her up was fun. She cleaned up well and I felt her pulse. Bonding with her was easy. She was so darn cute and her simplicity was very attractive to me. But sailing her by myself was going to be my challenge. I just didn't see it. The first night I slept on her was great. I slept on her alone. The bay was calm and floating in the middle of the water away from the mainland was therapeutic. When I woke up the next morning and went back to the big boat, I stepped on Gracious Lady with excitement saying 'I LOVE IT'. Little did I know that at that moment, someone was cutting my anchor line. When I posted the boat incident video on social media, one of my Sister friends pointed out that though the incident was almost a complete disaster, the disaster didn't happen. and what could have happened, didn't. I believe that the possible disaster was intervened by two 'Stranger Angels'. I believe that a divine intervention had taken place. I knew there was a message in all of this. 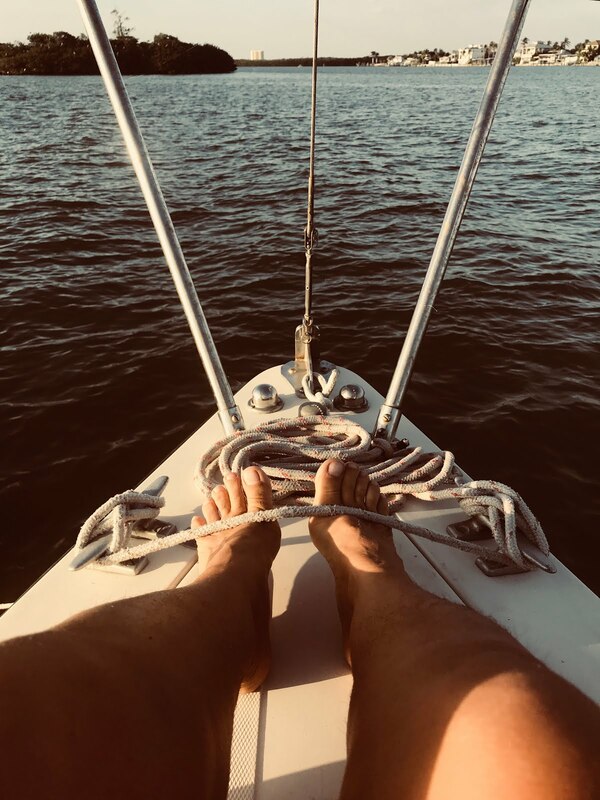 Just because others thought it would be cool to sail it up the coast didn't mean that it was the right thing for me to do. How often does this happen in all of our lives. Someone thinks we should be doing something different or that we should be someone that we are not. Something that looks right to someone else doesn't necessarily mean that it is right. In 2015, when I sold everything and began a nomadic life, it was because it was right for me. I couldn't explain why it felt right and I understand why my choice was confusing to others but I knew it was what I was supposed to do and having done it makes me a much happier person. I'm a backpacker who lives on a sailboat with her sailing 'Southern man'. I'm not a sailor, at least not now. My 'Southern man' is a sailor. I love that I have my little boat and I love that he bought it for me to write in. Even though he thinks I would do a great job sailing it and that I have enough skills to do so, I have to receive that as a wonderful compliment, not a suggestion to change my intention. My body is my moving vessel and it puts me where God wants me to be. I now see it as a God wink. I no longer am angry at the people who cut my line with the intention of causing me harm; a Power much stronger than them prevented me from being hurt. Instead, I have forgiven their trespass against me and am grateful that it happened; it directed me back to my path. If I ever see my trespassers again, and I hope that I do, I will tell them 'thank you'. I will tell them that their aggressive act probably saved my life.